Breaking from the valley on a gray September morning, I walked up a wide path that paralleled Big Cottonwood Creek, then cut off on a steep trail into the woods. After a few hundred feet of hiking, the dank smell of thunderstorm-moistened foliage filled my lungs; the north-facing rock walls loomed over me. I imagined I could have been days into a backpacking excursion, but I was actually just a 30-minute drive from Temple Square. Of all the popular hikes of the Wasatch Front—Mount Olympus, the BST, Bell’s Canyon—Lake Blanche is among the best for easy wilderness immersion. To find it, head about 4.5 miles up Big Cottonwood Canyon Road and park at the Mill B South Trailhead, at the onset of the hairpin S-turn, on the right. A short stretch along a paved path leads to the trail on the right, marked with a sign. Distance discrepancies abound, however, as the parking-lot sign informs you it’s 3.7 miles (one way) and the next sign a quarter mile up the trail says 2.8. My trusty Strava GPS app showed 3.3 miles from the parking lot to the edge of Lake Blanche. Either way, it’s a grinding uphill route that gains 2,700 vertical feet. It begins in pines alongside a burbling stream before hugging the edge of a steep embankment that affords views of the slab rock walls on your right leading up and over to Little Cottonwood Canyon to the south. The aspens are thick at times, filtering the light and providing shade on the hot days, or soothing aesthetic relief on any day. Gambel oak, maple and dozens of plants and bushes line the trail, often so tight that the trail is almost obscured from view. Since the trail is so SLC-convenient, you won’t likely have it to yourself. I hiked recently on a Tuesday morning, and encountered almost a dozen hiking groups. Enjoying the light social aspect on this trail helps ease the ascent, as it seems most folks are eager for the chance to rest and make light banter. One middle-age couple had stopped, and pointed to where they had recently seen a moose. They were rattled at seeing the large creature—bear repellent out of the holster, apparently ready for a fight if it came to that. Would-be trail runners would be wise to avoid the lure of such a scenic trail in search of a new jogging destination. The trail’s steepness and ubiquitous rocky formations make a sustained run tough, as I found during a disappointing early-summer effort. Clots of rock jam up the trail in spots and loose rocks make for uneasy footing in others; the trail lends itself far more sensibly to a steady hike. You’ll see a boulder scree when you’re very close to your destination. Soon after, you’ll come to a wide bench of flat, smooth red rock that sits just above the reflective Lake Blanche, offering a natural rest area for sitting and taking in the stunning panoramic view. 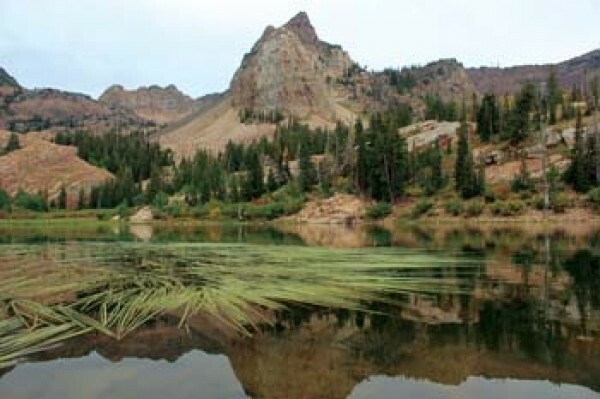 The lake leads to Sundial Peak, a pointy nose that stands on top of a bed of loose stones. In the foreground are the north sides of Mount Superior, Monte Cristo and Dromedary Peak. A scattered patch of tall, bright, yellow-leafed aspen, transitioning toward winter, stood out among the evergreens. The cool temperatures and changing colors whispered that fall is here, an ideal season to hike the mountains of Utah. Soon, the snows will require specialized equipment and skills to reach the same areas. Over a few hours, I had left the cityscape and refreshed myself with deep breaths of cool September air. The combination of close proximity, physical challenge and scenery teamed up to make for a must-hike Utah classic.